Our Hydraulic Car Lift is specifically designed for the transportation of Cars, with many wide door opening modes and spacious yet sturdy car, suitable for the transportation of large cars and ensuring the safety when passengers and cargoes both present in the car. Technically, advanced CPU control is applied, realizing contact free control to elevate the performance of the elevator, making it the best choice for cargo transportation in factories, workshops,warehouses and malls, etc. It can not only cut carbon steel, stainless steel, aluminum and other conventional materials, but also can cut non-metallic materials stably and effectively, in addition to enhance the speed of sheet metal processing effectively, it can also process standard laser machining, coupling welding units, which greatly improves product accuracy and productivity. Joylive Elevator Co., Ltd. was founded in Kunshan city, Jiangsu province in 2002. After more than a decade’sdevelopment, Joylive has become a famous brand with the enterprise conception of "Intelligence, Environmental-Friendliness and Supreme Service" in the industry. Q: Why do you choose Joylive Hydraulic Car Lift ? Q: What’s the necessary information should be provided before purchasing an Hydraulic Car Lift ? A: 1).How many people loading? (6persons means 450kg, 8persons means 630kg, 10persons means 800kg,13persons means 1000kg etc. 3).What’s the shaft size? Shaft width and shaft depth? Q: What advantages your Hydraulic Car Lift have? A: We use the best parts for our elevators, gearless motor from xizi Otis, door operator from Shenling or Wittur, control system from Monarch or STEP etc. All these parts from the biggest and the best suppliers in the world. Actually, elevator is an assembled product, like iphone. And we control the design, control system, and the parts quality and delivery. Our strict management make sure the elevator can be installed without any problem and all parts will be fixed in the correct position, our design make sure the elevator can run stably and efficiently..
hydraulic scissor car lift is one special type scissor lift for car storage or mainain. You can find it normally in 4S shop, exhibition hall, which also used widely in home or apartment garage indoor or outdoor. 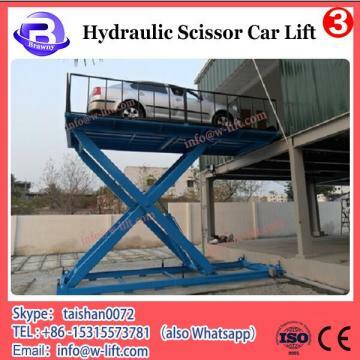 Pit mounted installation can save much space above ground, and durable high quality scissor hydraulic car lift for sale provide convinient access for car. 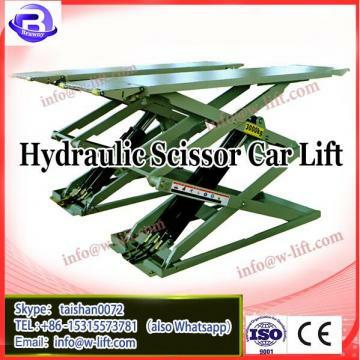 durable high quality scissor hydraulic car lift for sale is specifically designed for the transportation of Cars, with many wide door opening modes and spacious yet sturdy car, suitable for the transportation of large cars and ensuring the safety when passengers and cargoes both present in the car. Technically,hydraulic scissor car lift advanced CPU control is applied, realizing contact free control to elevate the performance of the elevator, making it the best choice for cargo transportation in factories, workshops,warehouses and malls, etc. hydraulic scissor car lift Special structural design, small area, high-quality steel material, strong four cylinder structure. 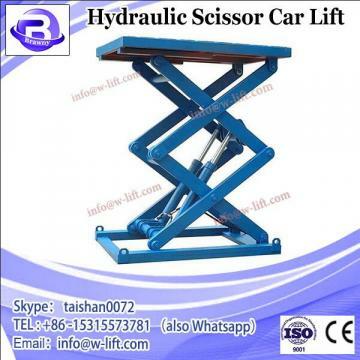 Thin structure,durable high quality scissor hydraulic car lift for sale can save more space for maintenance service personnel to make the operation more convenient.